Beethoven's Violin Concerto was the only significant work of this genre to appear between Mozart's five concertos of 1775 and Mendelssohn's E minor Concerto of 1844. This handbook explores the background to Beethoven's work, its genesis, its place in the composer's oeuvre and the influences which combined in its creation. It describes contemporary reactions to the work both in the musical press and in the concert hall during its first crucial years, and explains how it was eventually accepted into the repertory, spawning numerous recordings and editions. 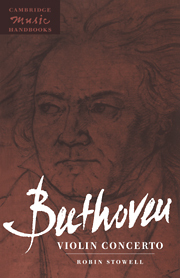 The principal sources and many of the work's textual problems are considered, including discussion of the composer's version for piano and orchestra, Op. 61a. A detailed account of the work itself is followed by a review of the wide variety of cadenzas that have been written to complement the concerto through its performance history.